Gunstock is like an aging rock star on Red Bull. Gunstock opened in 1937, the New Hampshire ski resort that hovers over Lake Winnipesaukee still cranks up the skiers, and seems rejuvenated and lively as ever. Like Mick Jagger or Rod Stewart, this original ski area continues to stage snowy entertainment that spans the generations, with ambitious evening events to shake things up under the lights on winter nights. And like most iconic stars of song, Gunstock has had some work done to preserve and improve in recent years. $10 million has been invested at Gunstock in the past decade (which would buy a lot of wrinkle cream). The Gilford ski area has received two lifts – a high-speed base to summit quad installed in 2003 which shortened the 1,400’-vertical trip to the scenic top to just 6 minutes and a new Gunshy lift in 2009. Lights for night skiing and ramped up features in the Blundersmoke Terrain Park have brought out a more youthful glow – so to speak. 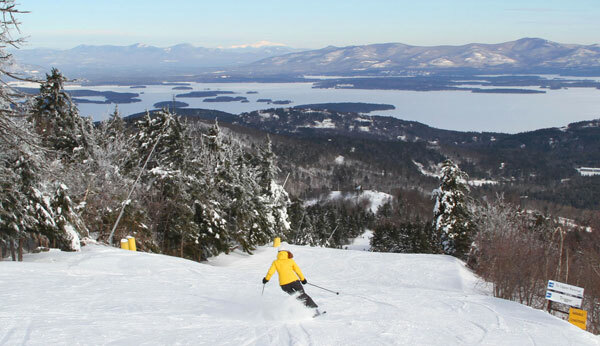 Gunstock is still rockin, and its not just your grandfather’s ski area anymore. One of the biggest boosts to Gunstock’s goings-on is their evening events. Gunstock Rocks Saturday Night -literally. That’s the name of Gunstock’s family friendly indoor outdoor party happening every Saturday under the lights from 4pm-10pm. For a “one price does it all” admission of $30 per person, you and your kids can ski or snowboard, rent equipment, get ski or snowboard tips from the Learning Center pros, and take unlimited tubing rides on the Thrill Hill. Gunstock Rocks is definitely geared toward families, starting with the all-inclusive pricing so kids aren’t hitting mom and dad up for tubing money after shelling out for a lift ticket. What’s more – Mom can get quick fix tips from an instructor without having to pony up for an entire lesson. Dad and son can try out snowboarding with a free (well – included) loaner board from the shop and get some professional how to’s from a snowboard coach on hand. After skiing under the lights, you can take it inside for a hot cocoa or relax under the stars by the bonfire. The kids can tube to their heart’s content on the Thrill Hill – New Hampshire’s longest tubing park. If parents tire of this senseless but silly sliding activity after a few spins, they can leave the kids to their laughs, and go inside the grand old lodge for libation in the Powder Keg Lounge. Gunstock Rocks could be the highlight of your weekend, and a bright beacon at the end of your dark dreary work (and school) week. The lights are on, the chairlifts are fired up with night skiing on 21 trails and 5 lifts, and every Saturday brings a different theme, you can find out by checking Gunstock.com for the designated details (and special deals) for upcoming nights. Last season, Gunstock hosted such dynamic themes as Game Night with independent vending companies bringing in a fleet of arcade games for the evening to play between runs. Movie night was another popular venue with an outdoor theater showing ski flicks and a roaring bonfire for roasting s’mores. Another theme that will surely be back by popular demand is live band night. These evening are often spurred on with a deal like “high school night” which encourages students to bring their good report cards to receive a discount on the evening’s admission, and “traitor night” when discounts are provided to passholders from other ski areas (shhh –they’ll never know). Other special deals will be posted on Gunstock’s website, like “passholders bring a friend night,” encouraging folks to introduce new skiers to their mountain Sounds more rewarding than just treating your friend to a forgettable movie on the flat screen. If you prefer a midweek mountain night, Gunstock hosts another hillside party on hump day. “Wall to Wall Wednesday” it’s called. The concept is the same, all-inclusive pricing for skiing and riding, lessons and rental equipment, the hours are a bit more conservative (it’s a school night after all) closing at 9pm, an hour earlier than on weekends and the price is less too – $25 per person. Last but not least, Gunstock throws the biggest snow ball of the year on New Year’s Eve. Magic Mountain Eve at Gunstock takes place 6pm til after midnight on Dec. 31. The festival is open to families with all inclusive pricing (last year was $75 for adults, $40 for kids, and $20 for youths). “It’s by far the best night at Gunstock, and the best New Year’s party I’ve ever experienced, and I am a third generation in the ski biz,” said Bill Quigley, Director of Marketing at Gunstock. Gunstock’s vertical venue stays open for late skiing and riding New Year’s, plus there’s a buffet dinner and dancing to a live band, or karaoke if you’re a wannabe crooner, all in the Main lodge. Outside besides skiing and tubing, the resort offers snowshoeing and horse drawn carriage rides through the woods. At midnight, the skies over Gunstock are ablaze with fireworks. Quigley said throughout the fun filled New Year’s celebration, vendors and suppliers will be giving away swag. For parents with little ones, daycare is available. For teens, the Stockade is transformed into a young adult zone with games and a place to “chill” inside for this denim-loving demographic. Gunstock is clearly carving out a nighttime niche, providing an active outdoor alternative for kids and adults to enjoy together. You can hang with your teens in the Terrain Park or slide on a slippery tube – which is way cooler than hanging at the Mall until closing time, or dropping serious dough at the cinema (where the only action is on the screen) and binging on trans-fat topped popcorn. Gunstock’s 75-year history of leadership in the ski biz started with rope tows, ski jumps and single chairs, and now includes Ziplines and Big Air Bags. The first chairlift in New England was constructed at Gunstock in 1937 (the second in the country following Sun Valley Idaho in 1936) as part of President Roosevelt’s Works Progress Administration, along with the alpine-style base lodge that still hosts skiers today, with significant enhancements and expansions. Gunstock Ski Area (previously Belknap Mountain) has come a long way in seven decades from that original single-seater that served four trails. This winter’s night skiing – infused with a frenzy of events – is evidence that this septuagenarian ski resort isn’t just going to grow old gracefully, or blow out the birthday candles and go to bed early. Gunstock’s high speed quad chair to 2,300-feet is far more swift and social than that old single chair. What hasn’t changed since the 1930’s is the families of skiers that gather at Gunstock on winter days and now nights to make their turns, chat with fellow skiers, take in the fresh air and views of the lake, and have some fall-line fun. Gunstock has had its ups and downs – on classic trails like Gunsmoke and Flintlock; and on the general ledger – remaining county-owned is unique in this day and age of mountain monopolies and alpine acquisition. But this rock star of a ski resort has managed to adapt from vinyl to 8-track, to CDs and downloads in the past seven decades. Gunstock continues to reload with its sights on the next generation while still spinning the oldies but goodies for the historians on the hill. No matter your age, snowboarder or skier, Gunstock rocks.